All-ceramic restorations are attractive because of their long lasting esthetics and the ability to withstand the oral conditions. However, bonding to ceramics has challenged the dental community for the last few decades. The clinical success of a ceramic restoration is strongly dependent on the quality and durability of the bond between the resin cement and the restoration. This study presents the bonding mechanisms and the mechanical tests to evaluate the adhesive interfaces of resin-bonded ceramic restorations, mainly the zirconia-based restorations, which are the most popular. An adequate bond involves ceramic surface changes for mechanical retention, which can be achieved using primers, such as acids and airborne particle abrasion. Selective etching of high crystalline content ceramics mostly occurs within grain boundaries that offer little micromechanical retention and an insufficient bond to resin. The most popular surface treatment to improve adhesion to high crystalline content ceramics involves the treatment of surfaces with airborne particle abrasion and chemical bonding. Yet, there are reports on new methods to enhance the resin bond to zirconia that need further investigation. This study provides scientific evidences to guide the clinical procedures on bonding ceramic restorations. At first, one could imagine that an all-ceramic restoration would not withstand the intra-oral service. It could be true if the restoration was not to be bonded to the tooth structure or remaining restorative materials (eg, composites and metals), working as an integrated system where diverse stresses, from chewing and parafunctional habits (eg, bruxism), are distributed throughout the system because of appropriate bonding [1••]. This rationale is supported by the ISO 6872:2010  standard that classifies the ceramics according to the intended clinical use and makes the distinction between adhesively and nonadhesively cemented restorations. Adhesion is defined as a molecular (or atomic) attraction between 2 contacting surfaces (substrates) promoted by the interfacial force of attraction from different molecules (or atoms). This is distinct from cohesion, which is the attraction between same types of molecule within 1 substance. These concepts are important in the distinction between adhesive and cohesive failures, presented later on in this work. The adhesion phenomenon can occur via (a) physical, (b) mechanical (structural interlocking), or (c) chemical mechanisms, or a combination of the 3. Whenever an adhesive agent is used to bond 2 materials and it solidifies during bonding, the process is called adhesive bonding [1••, 3]. A relatively strong bond can result from the synergistic action of a number of bonding mechanisms, such as a large area of intimate contact providing numerous sites for the creation of weak secondary bonds, and the presence of surface undercuts at the microscopic level [1••]. The adhesion to the tooth structure (enamel and dentine) is well explored and explained in the dental literature and, therefore, it is not the primary goal of this manuscript. However, ceramic restorations need to be bonded to the tooth structure and/or other remaining restorative materials. The clinical success of the restorations also depends on an adequate bonding at the cement-tooth structure interface. Nevertheless, different primers and adhesives coupled with specific bonding procedures drastically reduce the microleakage and its consequences. Currently, glass ionomer cement (GIC) and resin-based cements are the primary choices for bonding ceramic restorations to the remaining tooth structure. GIC and resin-modified GIC (RMGIC) are often used to cement acid-resistant ceramics, mostly because these cements are very easy to use. Yet, the most popular and effective cements for all types of ceramic restorations are the resin-based composites, especially the systems containing the 10-methacryloyloxydecyldihydrogenphosphate (MDP) monomers [1••]. These cement systems contain special adhesive molecules that can potentially promote chemical bonding with all dental ceramics. However, the longevity of this bond remains unclear. Considering the chemical reactivity to acids, the ceramics can be either acid-sensitive or acid-resistant, according to the degree of surface degradation produced by acids. Acid-sensitive ceramics (eg, feldspar-, leucite-, and lithium disilicate-based ceramics) are readily etched creating micromechanically retentive surfaces. Acid-resistant ceramics, or high crystalline content ceramics, (eg, glass-infiltrated alumina and zirconia, densely-sintered alumina ceramics, and Y-TZP ceramics) do not show much surface degradation by etching, preventing a reliable micromechanical bond to resin [1••, 4, 5, 6, 7, 8]. It has been reported that the clinical success of resin bonding procedures for ceramic restorations and ceramic repairs depends on the quality and durability of the bond between the ceramic and the resin. The quality of this bond depends upon the bonding mechanisms that are controlled in part by the surface treatment that promotes micromechanical and/or chemical bond to the substrate [4, 5, 6, 7, 8, 9, 10, 11, 12, 13, 14, 15]. Structural and surface analyses of etched acid-sensitive ceramics have shown that different etching patterns are created according to the ceramic microstructure and composition, and according to the concentration, application time, and type of etchant used [4, 5, 6, 7, 9]. Fluoride-containing etchants such as hydrofluoric acid (HF), ammonium bifluoride (ABF) and acidulated phosphate fluoride (APF) have been used to etch dental ceramics [4, 5]. Alteration of the surface topography results in changes in the surface area and on the wetting behavior of the ceramic [4, 5, 6, 7, 9, 10, 11, 12, 13, 14, 15]. This also changes the ceramic surface energy and its adhesive potential to resin . Thus, the ceramic microstructure, composition, and morphology after surface treatment (priming) should yield potentially useful information on the clinical success of the bonding procedures for ceramic restorations and ceramic repairs, justifying the interest of dentists and researchers on potential ceramic surface treatments, which still offer some challenge for the acid-resistant ceramics [1••]. As acid-etching is not an effective surface treatment for acid-resistant ceramics, other methods to produce micromechanical retention have been used, including airborne particle abrasion systems and coarse diamond rotary instruments. Several studies [6, 7, 14, 15, 16, 17] reported that airborne particle abrasion methods using alumina particles or silica-modified alumina particles (silica-coated) produced greater surface roughness (Ra) values and that silica-coated surfaces showed a significant increase (76 %) in the concentration of silicon, which should enhance bonding to resin via silane coupling agents [7, 17]. Therefore, the silica-coating (ie, silicatization) systems (eg, Rocatec and CoJet, 3 M ESPE, Seefeld, Germany) have been used to create a silica layer on metal and ceramic surfaces through a high-speed surface impact of the silica-modified alumina particles that can penetrate up to 15 μm into ceramic and metal substrates. This tribochemical effect may be explained by 2 bonding mechanisms: (1) the creation of a topographic pattern via airborne particle abrasion allowing for micromechanical bonding to resin; and (2) the promotion of a chemical bond between the silica-coated ceramic surface and the resin-based material, via a silane coupling agent [1••]. Silane bonds to Si-OH on a ceramic surface by condensation reaction and the methyl methacrylate double bonds provide bonding to the adhesive. As long as there are adequate Si-OH sites on the ceramic surface, satisfactory bonding should be achievable [15, 17]. Therefore, if the goal is to obtain a thin silane coating on any ceramic surface, the protocol should consider the various ceramic microstructures and the silane types, and mechanisms to reduce the thickness of the silane layer, such as heat treatment . In addition, the type of resinous adhesive also plays and important role on the bond to high crystalline content ceramics. It has been reported that the chemical bond to these ceramics is improved by using adhesive resin systems containing phosphate monomers, eg, MDP [1••, 15]. Therefore, the adhesion between dental ceramics and resin-based composites is the result of a physicochemical interaction across the interface between the resin (adhesive) and the ceramic (substrate). The physical contribution to the adhesion process is dependent on the surface treatment and topography of the substrate and can be characterized by its surface energy. Alteration of the surface topography by etching or airborne particle abrasion results in changes on the surface area and on the wettability of the substrate, which are related to the surface energy and the adhesive potential. In addition, the surface energy of a solid is greater than that of its interior where the interatomic distances are equal, and the energy is minimal [1••]. Similarly, at the surface of the lattice, the energy is greater because the outermost atoms are not equally attracted in all directions. This increase in energy per unit area of surface (J m-2 or N m-1) is referred to as the surface energy (γ), or surface tension for liquids. Therefore, the surface atoms of a solid tend to form bonds to other atoms in close proximity to the surface, reducing the surface energy of the solid. Again, achieving an energy balance or the lowest energy state is the driving force for the chemical bond between the adhesive and the adherend. Yet, the surface energy and the adhesive qualities of a given solid can be reduced by any surface impurity or contaminate, such as human secretions and air voids. The functional chemical groups available or the type of crystal plane of a space lattice present at the surface also affect the surface energy [1••]. Nevertheless, a clean (ie, no contaminants) and dry surface ensures that the adhesive has the best possible chance of creating a proper bond with the adherent. In addition, the wettability of the adherend by the adhesive, the viscosity of the adhesive, and the morphology of adherend surface influence the ability of the adhesive to make intimate contact with the adherend. Thus, to meet the challenge of resin-bonding to any high crystalline content ceramic, including zirconia-based ceramics, one must consider all the aspects listed above. Bond strength tests have been used to predict the clinical performance of resin-bonded ceramic restorations. Yet, most of these tests exhibit a wide variability in fracture patterns and bond strength values. The commonly used shear bond strength test is very sensitive to the method of application of the adhesive and the design of the testing arrangement, often producing a fracture at a distance from the resin-ceramic adhesion zone that may lead to erroneous conclusions on bond quality [10, 15, 18]. Yet, many studies using shear bond strength test arrangements suggested a lack of reliability of such measurements and identified nonuniform stress distributions along the bonded interfaces [7, 10, 15, 18, 19]. Nevertheless, when they are correctly performed and interpreted using fractography analysis, they may adequately rank experimental groups with relevant differences. In the search for a method that produces uniform stress distribution across the interface, investigators have evaluated similar adhesive systems under different bond test configurations. They have suggested that a tensile bond strength test would be more appropriate to evaluate the bond strength of adhesive interfaces [1••, 7, 10, 11, 15, 18, 19]. The micro-tensile bond strength test, which is actually a tensile bond strength test with a reduced testing area, was developed as an attempt to eliminate the nonuniform stress distribution at the adhesive interface and to minimize the influence of interfacial defects. The reduction in the number and size of defects in the adhesion zone is thought to decrease the incidence of bulk cohesive failures and increase the tensile bond strength, regardless of the cross-sectional shape of the specimens. This test has been used to measure the bond strength of resin-based composites to tooth structure and to restorative materials, including all types of ceramics [1••, 7, 11, 15, 19]. Although the mode of failure is an important aspect of bond strength tests, it is not commonly reported. A detailed inspection of the fractured surfaces can indicate the failure mode of a bonded assembly. The fracture behavior of adhesive interfaces depends on the stress level, the flaw distribution, material properties, and environmental effects. Therefore, the fracture surface characterization combined with the analyses of fracture mechanics’ parameters are of great importance to understand and predict bonded interface reliability. They also reduce the risk for data misinterpretation such as the inference that the bond strength must exceed the cohesive strength of the ceramic when the fracture initiates within the ceramic material and away from the interface [1••, 7, 11, 15]. Therefore, failure analysis based on fractographic principles should assist researchers to correctly interpret the fracture phenomena [1••, 11, 15, 18, 20, 21, 22]. The above rationale on adhesion to ceramics should develop the fundamental basis to understand the clinical performance of bonded all-ceramic restorations, the possible failure causes, and the principles to improve the adhesion mechanisms of resin-based composites bonded to dental ceramics. Indeed, the long-lasting esthetics is the main reason for the increasing interest on all-ceramic restorations [1••]. The new polycrystalline dental ceramics are stronger and tougher, but have to be veneered for pleasant esthetics. Additionally, these restorations have to be bonded to teeth to have greater survival rate. Failures because of fracture are mostly related to the brittle nature of ceramic materials and an inadequate restorative design. 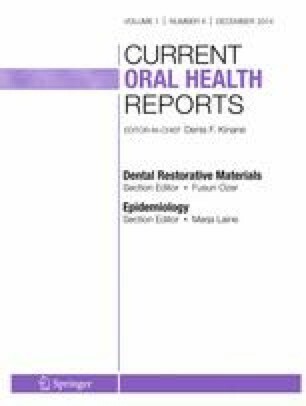 Secondary caries, fracture of the abutment and loss of periodontal support are biological complications frequently reported in clinical studies, but are not related to the ceramic materials [23, 24]. Biological complications are strongly related to the patients’ singularities, such as occlusal pattern, parafunctional habits, remaining tooth structure, oral hygiene, and local or systemic conditions, which are difficult to control. In fact, there is no evidence to say that marginal gap is clinically related to secondary caries. On the contrary, it is related more to the caries susceptibility of the patient [1••, 25]. Additionally, resin-bonding decreases the marginal leakage of ceramic restorations, improving the overall strength of the restoration [1••, 26, 27, 28]. In order to minimize failures in all-ceramic restorations, dentists should pay attention to case selection, tooth preparation, material selection, restoration design, cementation technique, occlusion equilibration, and patient preservation [1••, 29, 30, 31, 32]. Tooth preparation has a major influence on the durability and color (mainly shade and translucency) of the final ceramic restoration, because it will dictate the internal surface contour and the thickness of the ceramic restoration [1••, 32, 33, 34]. Analogically to cracks, sharp angles on a tooth preparation are stress concentrators and should be avoided. In addition, the fracture behavior and strength of ceramic restorations change as the ceramic thickness changes, which is theoretically explained by Griffith and clinically observed in chipped ceramic restorations [1••, 35, 36•]. Therefore, the amount of tooth reduction should allow for adequate ceramic thickness. Although color is an effect of light and subjective perception, the final shade of the restoration will modify as the thickness of the ceramic layers changes, especially when the thickness of the enamel ceramic layer is altered. As skilled hands can only execute what one’s brain perceives visually, clinicians have to be circumspect examining the patient and envisioning the treatment that best encompasses the various aspects of the final restoration: anatomically, biologically, structurally, functionally and aesthetically. However, since tooth preparation often influences the material selection for the final restoration, clinicians should be attentive to the fact that treatment planning may require modification after tooth preparation [1••]. Data from recent clinical studies reported survival rates of currently available ceramic systems within a range of 75 %–100 % in 5 years for veneered zirconia, 76 %–86 % in 3 years for veneered alumina, 86.7 % in 4 years for lithium disilicate crowns, and 93.5 % over 10 years for porcelain laminate veneers [36•, 37•, 38, 39••]. Catastrophic fracture was the most prevalent mode of failure for porcelain restorations, and was greatly associated with the restoration of nonvital teeth and to parafunctional habits (bruxism) [39••]. The cementation mode did not have a significantly impact on survival rates, which could mean that the existent surface treatment (conditioning with hydrofluoric acid) and bonding mechanism (silane and adhesive application) are adequate for conditioning acid-sensitive ceramics, such as porcelain and lithium disilicate. In general, the most common causes of structural failures reported from clinical studies are fracture initiated in the connector area of FPDs, either at the core-veneer interface or at the gingival embrasure; and chipping, cracking, and delamination of the veneering material [1••, 8, 25, 29, 30, 36•, 40, 41, 42]. Very few clinical studies suggested some type of adhesion failure, but none could confirm an interfacial bond failure [1••, 40, 43]. Losing retention does not necessarily result in the loss of the restoration, which can be easily cleaned, reconditioned and re-cemented on the prepared abutment. This fact (ie, no interfacial bond failure observed) mainly infers 2 possible explanations: the current adhesive protocols are clinically reliable, or the all-ceramic restorations structurally fail before interfacial bond failure. Well-designed, long-term clinical trials will clarify this uncertainty . Improving mechanical retention with an airborne particle abrasion system using alumina particles associated with a chemical bond that uses an adhesive/cement system containing a ceramic primer with a phosphate-based monomer such as MDP [44, 45]. Improving mechanical retention with an airborne particle abrasion system using silica-coated alumina particles to introduce an irregular silica layer onto the ceramic surface followed by a silane coupling agent, which promotes a chemical bond to any resin-based adhesive/cement system [17, 46, 47]. Although the above mentioned strategies are recommended for acid-resistant ceramics, extra caution is required when Y-TZP ceramic is used. When stabilized zirconia is subjected to tension (eg, chewing, grinding, airborne particle abrasion), a transformation from a tetragonal to a monoclinic crystal structure is induced in regions of enhanced stress concentration, such as around a crack tip. This transformation produces compressive stresses that oppose crack propagation, increasing the material’s fracture toughness and strength. Yet, this toughening mechanism can also undergo an undesirable behavior known as low temperature degradation (LTD) [1••, 30]. Therefore, there is a concern among researchers related to the possible consequences of airborne particle abrasion on the mechanical behavior of Y-TZP ceramic and, therefore, the longevity of zirconia-based restorations. Some studies attempted to explain this controversial behavior by reporting that the increase on the monoclinic content provided by airborne particle abrasion results in greater fracture strength [48, 49, 50] and the fabrication process, such as milling, may induce more severe flaws than particle abrasion [51, 52, 53, 54•]. Other studies reported a decrease on the flexural strength of zirconia specimens subjected to airborne particle abrasion after mechanical cycling [55, 56, 57]. Such divergence in reports is probably related to different research protocols that use particles of different size, morphology and hardness and different application angles and pressure of airborne abrasion. These variables govern the roughness pattern created on the ceramic surface . Therefore, the lack of standardization for the experimental parameters, which produces controversial results, should challenge the researchers to define an airborne particle abrasion protocol capable of producing a surface roughness pattern that improves the adhesion with the resin cement without creating new flaws that may compromise the ceramic fracture strength. Nevertheless, it seems to be a trend to use a reduced particle size and low airborne abrasion pressure. Regarding the type of particle, studies found similar bond strength values between Y-TZP specimens subjected to airborne abrasion with conventional alumina particles and silica-coated alumina particles [59, 60]. However, after 6 months of aging, silica-coated zirconia surfaces presented a higher bond strength , which may be because conventional alumina particles are sharp and hard, whereas silica-coated alumina particles are softer and smoother, being less aggressive on the ceramic surface and facilitating the chemical bond [1••]. Options to airborne particle abrasion have been investigated, such as Er:YAG laser irradiation , silica-based film coatings , acid etching with dichloromethane (CH2Cl2), and hot etching , Y-TZP particle deposition , and nonthermal plasma treatment . Modifications to Y-TZP ceramic were also proposed. A graded structure was developed by infiltrating glass into Y-TZP ceramic, transforming an acid-resistant ceramic into an acid-sensitive one . As these novel strategies need further investigation, the airborne particle abrasion is still considered the surface treatment of choice for acid-resistant ceramic. However, manufacturers routinely provide cementation recommendations that clinicians should consider. Bonding to ceramics is still a challenge to the dental community. The clinical success of a ceramic restoration is strongly dependent on the quality and durability of the bond between the resin cement and the restoration. An adequate bond involves ceramic surface changes for mechanical retention and chemical adhesion. New methods to enhance resin bonding to zirconia need further investigation. This paper provided scientific evidence to guide clinicians on bonding ceramic restorations. This study was partially supported by CNPq do Brasil grant # 304995/2013-4, PNPD from Capes do Brasil, and Fapergs scholarship. Alvaro Della Bona received a research grant from Capes do Brasil (#304995/2013-4). Márcia Borba, Paula Benetti, João Cezar Mosele, and Rafael Mores declare that they no conflicts of interest. Oscar E. Pecho received a grant from Capes Brasil. Rodrigo Alessandretti received a grant from FAPERGS Brasil.